We are pleased to announce that not just one, but two of the teams from Bournemouth School for Girls have been declared winners of the challenge, beating stiff competition from students from over 140 other schools throughout the UK. The students were set challenges by three companies – Tata Communications, Cancer Research UK, and Standard Life – who also acted as the overall judges for this year’s Digital Day. Each team had to present their ideas to their fellow students and to a select group from Redweb, as their digital partner for the day, were on hand to help them with questions surrounding digital. Team Invigorate, made up of students Ellie Mayfield, Wednesday King, Hannah Bennett, and Lauren Jones, won the challenge set by Tata Communications. This challenge asked students to solve problems like unemployment, poor health, or education standards using digital. Team Invigorate’s idea was to help the heath industry in India by have a solar panelled drone in each hospital that has a smart camera attached, detecting illness using infrared technology and through assessing visual symptoms. Patients would also be able to enter their personal data into an app, with the information being sent to a database to be evaluated by hospital staff, resulting in shorter wait times for those in desperate need. The other winning team from the school was Team Maxifit, comprised of students Isabel Kenny, Emma King, Amy Van Wingerden, and Abby McAdie, who won the challenge set by Cancer Research UK. Their challenge was to use digital to raise awareness for obesity. 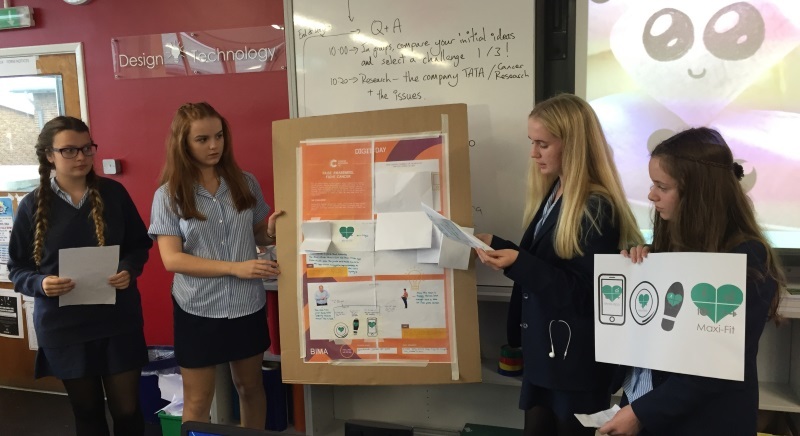 Maxifit was the girls’ winning idea – a pack to help solve the problem which included a plate that would track the foot you eat and nutrients gained, and an insole to place within your shoe to track exercise, linking up to GPS data. This would all link up to a mobile app which would send the user updates on their health, allow them to scan receipts, and suggest healthier alternatives based on their eating habits. Each challenge had a particularly high number of entries this year and judges commented on the high standard of all entries received. We are very proud of the girls’ achievement and of their innovative ideas. We would also like to extend our congratulations to the winners of the Standard Life challenge and celebrate the fantastic ideas from all the competing students. This year’s winners will receive a host of great prizes including Thorpe Park tickets, Vue Cinema tickets, Tata Communications goody bags, and a tour of the Cancer Research UK offices which includes a workshop with them. 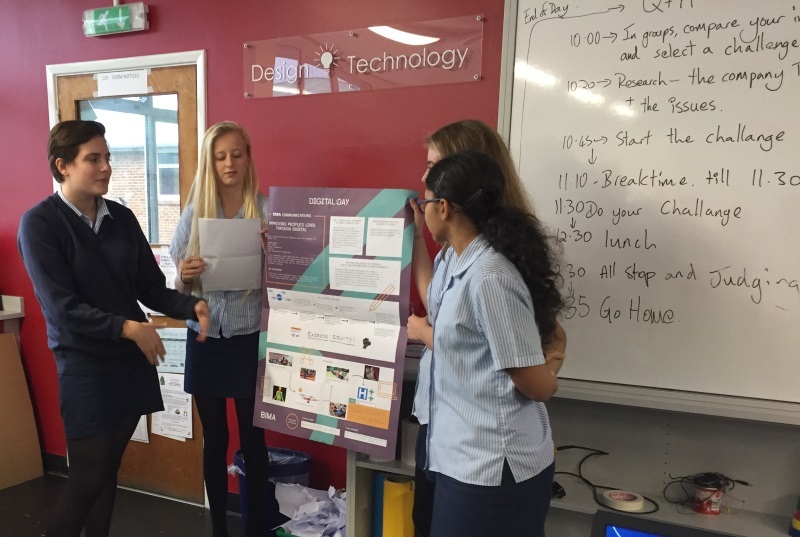 This is not the first win that Redweb and Bournemouth School for Girls have had at Digital Day, with a team winning last year’s Standard Life challenge as well. Since its formation in 2012, Digital Day has reached out to over 15,000 young people, with 140 schools and 100 agencies taking part this year. Our mission of inspiring careers in digital also extends to our annual student careers conference Digital Wave, which invites students to hear keynotes from guest speakers and seek advice on career paths within the industry.